Our members are trained to assist lawful Search and Rescue agencies in locating missing persons by providing trained handler/dog teams, field/base technicians and other resources; to provide immediate first aid to save lives; and to educate the public about search and rescue. Our training is regular (weekly) and continuous (year-round), including blind and double-blind problems. 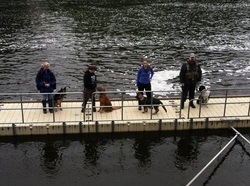 Our handler/dog teams are certified at least once every two years by qualified evaluators outside of K9SM membership. Our field/base skills are practiced at each weekly training session. Each of our members is required to understand the FEMA ICS fundamentals. Active members are those members who are certified or pursuing certification for base/field support and/or canine handler activities. Associate members are those members who support K9SM through the use of their special skills, knowledge, or equipment, but are not pursuing certification. Colleagues are persons and dogs who are members of other organizations or are friends of members, and periodically participate in training exercises, but are not seeking membership or have not yet committed to membership in K9SM. Copyright 2019 K9 Search Midwest. All Rights Reserved.